Today, we released version 2.5.0 of VLC for iOS with a strong focus on cloud integration. 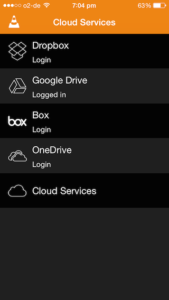 We added support for iCloud Drive, box.com and OneDrive. As part of iCloud Drive, you can have access to any cloud storage enabled app on iOS 8 and later. For box.com and OneDrive, we added native support, which allows us direct streaming from the cloud without having the user download a media first. 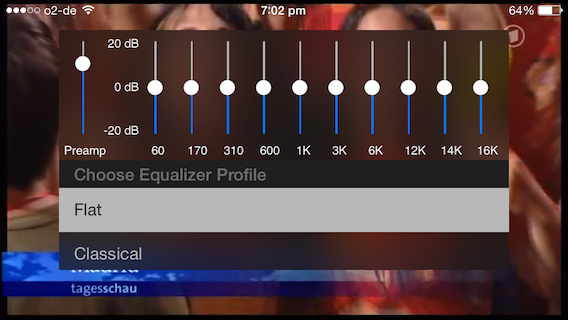 Furthermore, we cleaned-up the playback experience matching recent changes in VLC for Android and added the full 10-band equalizer known from VLC’s desktop ports. While reworking playback, we also integrated support for titles and chapters included in a few Matroska / MKV and MP4 files. Due to popular request, you can also lock the UI and rotation during playback. One last thing: you can share your media library between multiple devices on the same local network now! If you enable WiFi sharing and keep VLC active, it will appear in the “Local Network” tab of all iOS devices running VLC supporting both device to device streaming as well as downloads. Finally, we added a couple of new translations to Portuguese (Portugal), Portuguese (Brazil), Khmer, Faroese, Belarusian, Serbian (Latin), Tamil and Afrikaans along with the usual set of bug fixes and minor improvements. We hope you like this new version as much as we do.